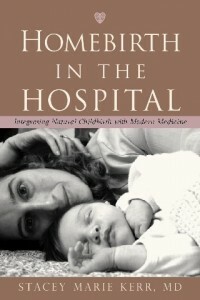 Dr. Kerr is a mother of two grown daughters, a family physician with strong roots in midwifery, and the author of Homebirth in the Hospital. She lives in Santa Rosa, CA. How many children do you have? Two, both girls. And a grandson who is 18 years old. And a granddaughter who’s one year old. What’s your specialty? Family medicine, including obstetrics and pediatrics. What’s your favorite parenting tip? Pregnancy and childbirth are preparation for parenting: “Parenting 101.” Guiding a child to maturity takes patience, perseverance, bravery, wisdom, acceptance of loss-of-control, humor, respect for your partner, and a lot of faith. These exact qualities are what sustain and guide you through childbirth. So childbirth as nature intended is a gift, teaching many of the skills parents will need through the challenges of the next 20 or 30 years. How do you get your kids to eat healthy food? That’s all we ate. That’s all we had. Until they were older (preteens) when we allowed ‘fast food,’ and by then they didn’t like it. They liked our good cooking! They could tell the difference. How do you work exercise into your family’s life? Our lifestyle incorporated exercise. We often did not have a car and walked miles every day. If it is part of everyday life, it happens. How do you recharge your batteries? Time alone. Walking (getting out in nature). Music. Making love. I think I’d like to deliver with a midwife, but my husband would prefer a doctor. Who delivered your babies and where?